Come One, Come All, to the Greatest Kids Camp on Earth. WHEN YOUR KIDS ARE OUT OF SCHOOL – Spring, Summer, Fall, and Winter Breaks – THE CHAKRA CIRCUS OF HEALTH CAMP IS IN SESSION. 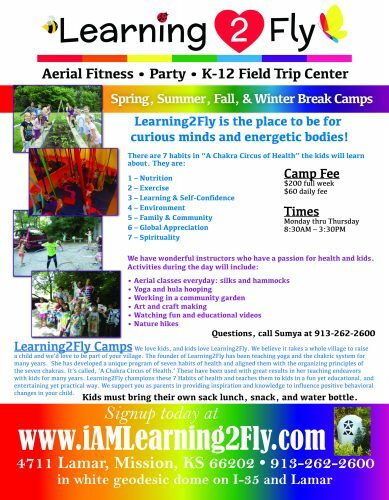 We love kids, and kids love Learning2Fly! We believe it takes a whole village to raise a child and we’d love to be part of your village. We host K-8th grade camps when SMSD is out of school! Be sure to check out our weekly aerial classes for kids and teens. We have many offerings for kids when they aren’t in school. We hope to see them thAIR! 2019 WINTER AND SPRING BREAK CAMPS… Summer 2019 camps start Tuesday, May 28 – Friday, May 31. The rest of the camps run Monday – Thursday. TO SIGN UP GO TO SCHEDULE AND SIGN UP PAGE. THEN NAVIGATE TO THE YOUTH CAMP TAB. Our unique, holistic health camps are loved and approved by parents, educators, and kids. Aerial Fitness Camps are so much fun! CAMP FORMS: Enrollment Form (complete and bring to the first day of camp) and complete Consent for Self-Administration of Medication form and submit as needed. Cancellation Policy: A refund will be honored if the cancellation request is received one week prior to the start of camp, but a $40 non-refundable administration fee will apply if you cancel. If you move a child to a different week, please give one week’s notice so we have adequate time to fill the spot. Parent and Child Aerial Class – Typically, it’s the 2nd Sunday of every month (usually) from 3:45PM – 5:00PM for one parent or any adult, and one child 6-11 years old! $25 Check Schedule and Sign up page! 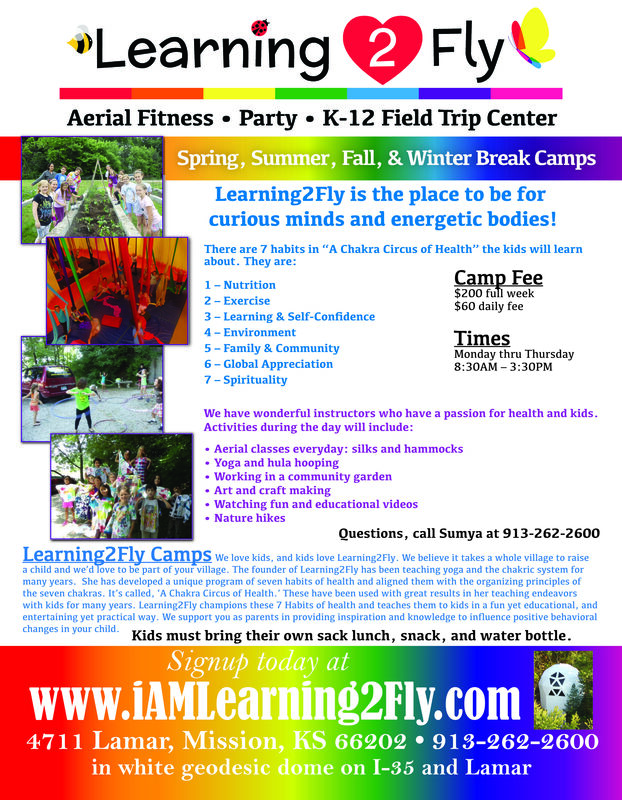 ‘A Chakra Circus of Health,’ Year Round Youth Camps – The founder of Learning2Fly has been teaching yoga and the chakric system for many years. She has developed a unique program of seven habits of health and aligned them with the organizing principles of the seven chakras. It’s called, ‘A Chakra Circus of Health.’ These have been used with great results in her teaching endeavors with kids for many years. Learning2Fly champions these 7 Habits of health and teaches them to kids in a fun yet educational, and entertaining yet practical way. We support parents in providing inspiration and knowledge to influence positive behavioral changes in your child. 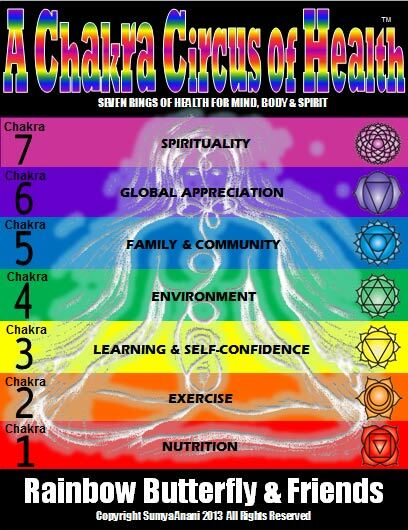 The Chakras are believed to be the building blocks of human nature. They correspond to the physical elements of nature and fundamental aspects of human experience such as needs for security, creativity, self-expression, etc. According to yoga philosophy, deficiencies or excesses in a Chakra may contribute to physiological, psychological, emotional, or spiritual disturbances. Children should be exposed to this information in a way they can comprehend at an early age. It will help pave the way for making healthier choices along the way.